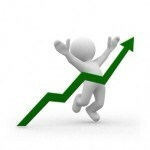 An SEO campaign is being prepared, a link building strategy is being planned. It’s time to pay for the provided services. 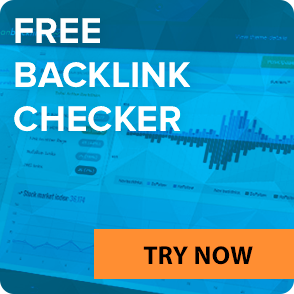 When it comes to paying for LinksManagement backlinks, there may arise many questions concerning the available payment methods. Thinking ahead, we have prepared this article to cover all your possible why and how questions. You can pay for our services by clicking on the pointer (1) in the upper right corner of the menu bar. In the pop-down menu, you will find the “Add funds” command (2). Clicking “Add funds” will bring you to the payment window. There you will have to choose the payment method you prefer. Each of them has its advantages, which we covered below. Payments with PayPal are super handy and secure at the same time. PayPal Express Checkout allows you to pay for the new backlinks as well as prolong the active ones without logging into your PayPal account every single time. Moreover, this payment method is the perfect all-in-one solution when you are running an SEO campaign, prepared by the SEO Expert Tool. Be sure that every step you have to follow within your SEO plan will be executed properly and you will take minimal care of the financial matters. 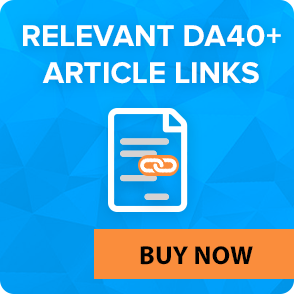 To buy the selected links you will need to click the “Buy” button in the cart and they will be added to your backlink profile. Your monthly links will stay with you since the payment for their prolongation will be automatically debited from your PayPal account. We do auto-charging to ensure that your SEO campaign goes on and keeps all your backlinks in place. It means that you don’t have to worry about your SEO while you are away, too busy to keep control of your balance, or merely forget to pay yourself. Moreover, our system lets you know how much money there should be in your account to purchase new backlinks or prolong the active ones. Keep in mind that every time you add funds to your balance a PayPal Express Checkout Billing Agreement is automatically created. So, if you want to refill your balance manually, cancel the Billing Agreement every time you pay for backlinks. This is done to cancel auto-charging. 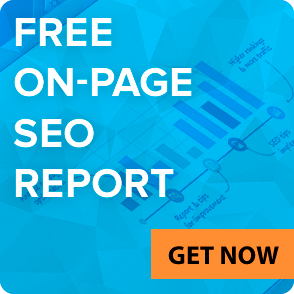 Advantage: express payment without interrupting the smooth flow of your SEO campaign. PayPal Subscription is another method of preserving your links since it automatically charges the same amount of money once a month. The payment for your monthly links is automatically debited every single month, so the risk of losing your links because of payment delays is minor. 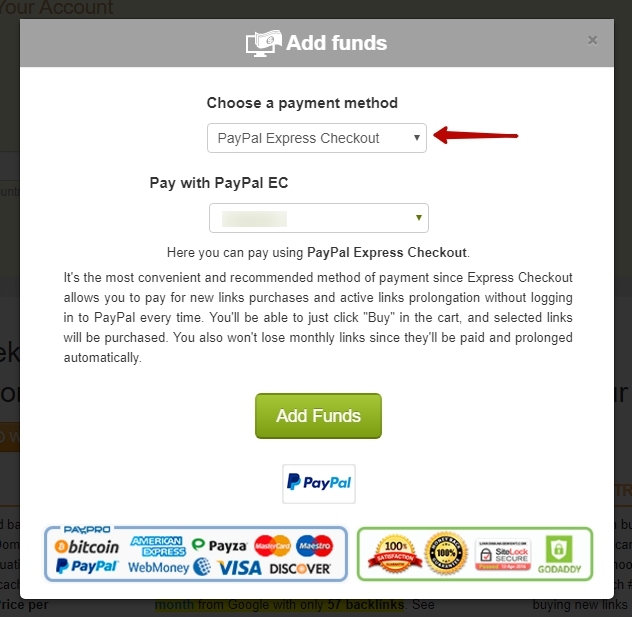 Usually, it works great if you have both PayPal Express Checkout and Subscription accounts. And you should clearly distinguish these two payment methods. PayPal Subscription ensures that there is enough money for your monthly backlinks prolongation and you are charged a fixed amount of money every single month no matter if you have new backlinks to purchase or not, while PayPal Express Checkout keeps control of your active monthly backlinks prolongation over time, and takes care of new backlinks purchase within your link building campaign automatically. You can manage both of these payment types whenever you want. This subscription system is set by default, unless you cancel it. Digital payments via VISA, MasterCard or Maestro cards are convenient, inexpensive, and traceable. They are also secure and trustworthy. You don’t need to create an account in any other payment system to pay for our backlinks. Besides, these payment systems operate worldwide and offer a wide range of privileges to the cardholders. The downside of such payments is that you have to control the payments for your monthly links on your own. You can be sure that none of the sensitive data from your cards is stored on our servers. Every payment made via one of these methods is safely encrypted and processed by our merchant processor which has an obligatory authorization from VISA, MasterCard, and Maestro. Still, you can always make sure that your monthly links and campaigns remain active. Just add the credit card for us to charge you for backlinks prolongation or new scheduled backlinks purchase. Keep in mind that every time you pay with your card, a Billing Agreement is automatically created. And if you accept it, we do auto-charging to ensure that your SEO campaign runs flawlessly and smoothly without losing the valuable backlinks. PayPro is a digital payment system that helps us accept payments online. This is our service provider that allows making payments via AMEX, Discover, Bitcoin, EPS, CashU and many other systems. American Express is one of the leading companies offering payment solutions to its customers. Basically, people like AMEX cards for the excellent customer service and decent rewards for the cardholders. For your convenience, LinksManagement features a way to pay for the links with AMEX cards. You’ll be redirected to our merchant service provider, PayPro. After the payment, the funds will be added to your LinksManagement balance. Please note that PayPro has a 4.5% commission fee that will NOT be added to your LinksManagement balance. You will have to pay an additional 4,5% fee. To avoid this, you should pay with PayPal since it has lower commission fees. Customers from Europe may have to pay an additional Value-Added Tax (up to 19%). Since we pay taxes in the USA, you may avoid paying this VAT by indicating a non-European address in the following step in PayPro interface. In case you use a European address, you’ll have to pay the VAT for PayPro services. It means that these funds will NOT be added to your LinksManagement balance. Bitcoin is a worldwide cryptocurrency and a digital payment system which was initially introduced in 2008. Making a payment with bitcoin is quick, easy, and ultra secure. The point is that you don’t need to enter sensitive card information. Instead, you can use your Bitcoin Wallet to pay a Bitpay invoice. Alternatively, you may send the payment manually directly to our Bitcoin wallet. Learn more. This is a well-known system and environment for online business activities with a high security level. All payments within the system are safe and anonymous. If you encounter any difficulties paying through the WebMoney interface, you can also send us the payment manually.